A recall was announced in mid-December 2012 of water-absorbing toys which the U.S Products Safety Commission says can cause death to children. The toys grow to 400 times their original size in water. When swallowed they can cause vomiting, dehydration and even death. Since the toys do not show up on an x-ray, surgical removal may be required. An 8-month-old Texas girl who swallowed a toy required an operation. 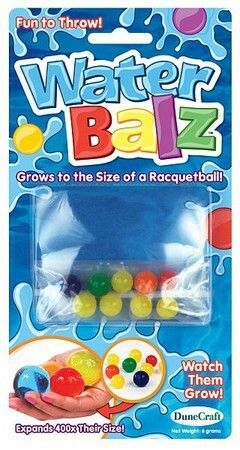 The recalled toys include Water Balz, Growing Skulls, H2O Orbs from the movie “Despicable Me” and Fabulous Flowers. Over 94,000 toys were sold in the U.S. Bed Bath & Beyond, Five Below, Hobby Lobby, Lakeshore Learning Materials, Microcenter, Urban Outfitters Direct and Wegmans, Amazon.com, incrediblescience.com, keyporthobbies.com, americantoystores.com, and Universal Studios.